Background: The alterations involved in step-wise transformation of a dental follicle to dentigerous cyst (DC) is not clearly known. Primary cilium and its protein have been hypothesized to be associated with DC. Mutation of a ciliary protein, polycystin-1 (PC1) is associated with autosomal dominant polycystic kidney disease. This study was performed to assess the immunohistochemical expression of PC1 between DC and postfunctional follicular tissue (PFFT). Materials and Methods: Thirty-one consecutive PFFT and 15 DC formed the study group. The PFFT and DC tissues were stained with antibody against PC1. Statistical Package for Social Service was used to analyze data. Descriptive statistics and Student's Chi-square test were appropriately used. P ≤0.05 was taken as significant. Results: Fifteen DC (100%) and 7 (22.58%) PFFT were positive for PC1. The difference was statistically significant (P = 0.000). PC1 expression was observed in the cytoplasm with varying intensity. Discussion and Conclusion: All PC1 positive epithelial cells' cytoplasm stained diffusely. Abnormal cytoplasmic expression of PC1 in all positive epithelial lining indicates that the PC1 probably is associated with cystic transformation. Dentigerous cyst (DC) is the second most common type of developmental odontogenic cyst. DC arises by fluid accumulation between reduced enamel epithelium (REE) and tooth, and may be associated with proliferation of the associated odontogenic epithelium. Differentiating early DC from an enlarged/dilated pericoronal space is a diagnostic problem. , In radiographs, the thin radiolucent line that surrounds the impacted or partially erupted tooth represents the position of postfunctional REE, fibrous tissue, and odontogenic rests. This tissue has been varyingly referred to as dental follicular or pericoronal or postfunctional follicular tissues (PFFT). Clinical, radiological and histopathological features are necessary for the distinguishing the early DC from dilated PFFT. This demarcation is necessary as their biological behaviors and management are different. DC has the potential to transform to ameloblastoma, mucoepidermoid carcinoma or squamous cell carcinoma , while PFFT by itself has limited growth potential and has a good prognosis. Odontoblasts express PC1 during odontogenesis. However, its expression in ameloblasts or REE or in odontogenic cysts has not been investigated. The role of PC1 in ADPKD cystogenesis has been established  and its probable role in DC has been suggested. This study was performed to assess the difference in immunohistochemical expression of PC1 between DC and PFFT. All tissues were fixed in 10% neutral, buffered formalin, embedded, and 5 μm section were prepared and stained with hematoxylin and eosin. 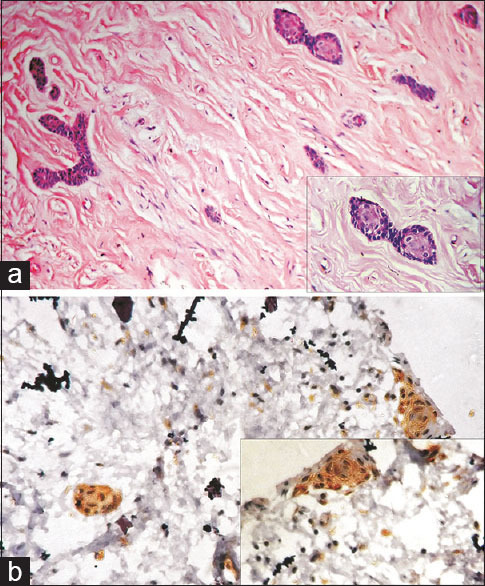 Histological type of epithelium (REE-lining/others), epithelial stratification (present/absent) and presence of inflammation, as per universal histopathological definitions, were recorded. The DC and PFFT epithelium were observed and recorded for basal (two cell thick layer representing the inner and outer enamel epithelium of REE) and/or presence of supra-basal cells. 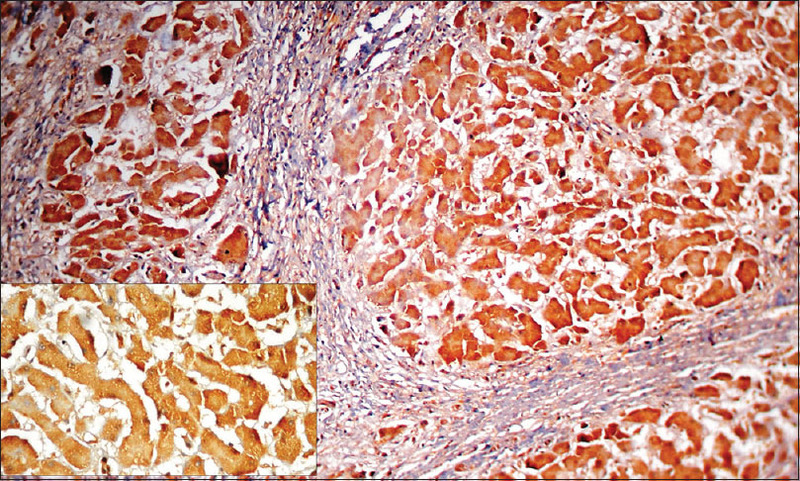 Formalin fixed, paraffin embedded tissues were sectioned at 5 μm thickness, stained with PC1 mouse monoclonal antibody (Abcam, Cambridge, MA, USA), developed from bacterially expressed fusion protein against the N-terminal leucine-rich repeats domain of human PC1 (7e12) as per manufacturer's recommendation. This epitope has been reported to be specific for human polycyctin-1. The Universal Horse Radish Peroxidase (HRP) Detection System (Abcam, Cambridge, MA, USA), a combination of biotin-streptavidin and hrp system was used as secondary antibody. As per manufacturer's instruction, human liver tissue sections were used as positive control [Figure 1]. Polycystin-1 staining was labeled as positive when at least 10% of all lining epithelial cells exhibited staining. The staining result (as either positive/negative), localization (extracellularly as either basal/suprabasal in the tissue; intracellularly as either cytoplasmic/membranous/nuclear) and staining intensity (nil, mild, moderate and intense) were noted for each DC and PFFT. Presence of atypical features was also noted down. All details were entered and analyzed using Statistical Package for Social Service version 17.0 (SPSS Inc., IBM, IL, USA). Descriptive statistics and Student's Chi-square test were appropriately used. P ≤ 0.05 was taken as significant. The study group had 15 DC and 31 PFFT (eight PFFT-P; 23 PFFT-C). The study group included 21 males (11 [52.4%] had DC; 5 [23.8%] each had PFFT-C and PFFT-P) and rest 25 were females [Table 1]. The mean age of the study group was 28.5 ± 11.1 years. The mean age of patients with DC was 34.2 ± 14.6 years while for PFFT it was 25.7 ± 7.9 years (PFFT-P - 24.4 ± 4.8; PFFT-P - 26.2 ± 8.7 years). The difference was statistically significant (P = 0.046). The distribution of jaw and teeth were not significant. Epithelial stratification was observed in six cases of DC and 23 cases of PFFT (six PFFT-P and 17 PFFT-C). The difference was not statistically significant [Figure 2]a-f]. Twenty-one instances of PC1 positivity were observed among study population. Fifteen DC and seven PFFT (three PFFT-P and four PFFT-C) answered positively for PC1. The difference between them was statistically significant (P = 0.000). The difference between positive and negative staining was not significant for gender or site. All DC, 3 (37.5%) of eight PFFT-P and 4 (17.4%) of 23 cases of PFFT-C answered positive for PC1. The difference was statistically significant [Table 2]. Of all PC1 positive stained cases, basal cell layer answered positive in 22 cases (15 DC, three PFFT-P and four PFFT-C). 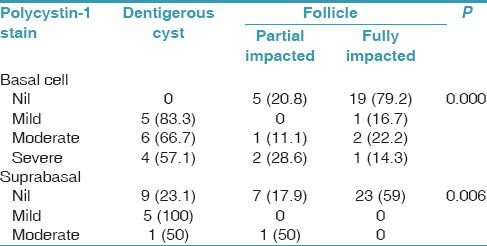 Of these only seven cases had suprabasal layer, of which six were DC and one from PFFT-P [Table 3]. In all positive cases, PC1 expression was observed in exclusively cytoplasm with varying degrees of intensity. However, in isolated foci in PFFT, few cells had exclusive cell membrane staining [Figure 2]e]. The PC1 staining was uniform in DC and positive cases of PFFT. In one case of PFFT, odontogenic rests stained positive for PC1 along with the epithelial layer. The stain appeared to be vesicular in nature and resembled that of liver sections [Figure 3]. In cases where suprabasal layers staining were observed, staining was similar to that of the basal layer. Mild staining was observed in five cases (83.3%) belonged to DC. Similarly, 66.7% of all cases with moderate staining and 57.1% of all cases with severe staining were DC. This difference was statistically significant (P = 0.000). Similarly, the difference between nil, mild and moderate staining pattern of suprabasal cell layer was also significant (P = 0.006) [Table 3]. The PC1 immunoreactivity of odontogenic tissues has not been described in the literature. To best of our knowledge, this study is first of its kind to study the PC1 immunoreactivity in odontogenic tissues. The difference of PC1 immunoreactivity between DC and PFFT tissues was statistically significant (P = 0.000). Cytoplasmic expression of PC1 in entire DC epithelial lining indicates that the PC1 probably is associated with cystic transformation. Epithelial stratification did not appear to influence PC1 expression. The results indicate that gender and stratification did not influence the PC1 expression in between DC and PFFT. The intensity of PC1 immunoreactivity between DC and positive PFFT epithelial tissue at the basal cell level and suprabasal level did not differ significantly. The variation in between the basal and suprabasal cell layers in all PC1 positive sections was also not significant. This indicates that there is no difference in expression between layers of epithelium both in DC and PFFT, when there is PC1 expression. The PFFT tissues are also exposed to same mechanical stresses similar to all layers of DC. Hence, it could be assumed that mechanical stress is not a contributory factor. , Moreover, recent works have postulated a dose-dependent relationship of PC1 with the severity of ADPKD disease. Exosomes have been demonstrated to be linked to PC1 expression  and also observed in Ameloblasts. These indicate that there is a high probability that PC1 could be accumulated in DF epithelium and produce favorable predisposing to cystogenesis. Mutations that prevent PC1's GPS cleavage, an early event in secretory pathway, also prevent its plasma membrane localization leading to cystogenesis. Probably, low level PC1 mutations (spontaneous or acquired) happening during late odontogenesis, could lead to abnormal subcellular localization and quantity of PC1 leading to differential expression in PC1 immunoreactivity between established DC and apparently normal PFFT tissues. Ameloblasts are known specialized, secretary epithelial cell with increased adhesion requirements. They may express PC1 during active functional stage. DC lining cells are exposed to higher pressure from cystic contents. This leads to increased intercellular interactions, and higher expression of adhesion molecules to keep the lining intact. This could potentially favor increased expression of PC1. The data presented herein could not clearly delineate PC1 as a cause or effect of cystogenesis. However, the study confirms the abnormal immunohistochemical presence and expression of PC1 in cytoplasm of DC. The relationship of renal-odontogenic apparatus has been previously postulated by this department earlier. The findings of the present study indicate a possible role of PC1 in the pathogenesis and progression of DC and probably other odontogenic cysts, which need further evaluation by larger studies and using molecular techniques. The exact timing of alteration in PC1 expression in PFFT will yield clues on pathogenesis of DC as well as the biological potential of PFFT and odontogenic rests. Technical assistance of Mrs. Kavitha Wilson and Mr. Rajan is gratefully acknoweldged. Authors would like to thank Dr. S Ramachandran, Principal, Ragas Dental College and Hospital and Prof. A Kanagaraj, Chairperson of the Institution for their continued support and encouragement. Damante JH, Fleury RN. A contribution to the diagnosis of the small dentigerous cyst or the paradental cyst. Pesqui Odontol Bras 2001;15:238-46. Anoop UR, Verma K, Narayanan K. Primary cilia in the pathogenesis of dentigerous cyst: A new hypothesis based on role of primary cilia in autosomal dominant polycystic kidney disease. Oral Surg Oral Med Oral Pathol Oral Radiol Endod 2011;111:608-17. Thivichon-Prince B, Couble ML, Giamarchi A, Delmas P, Franco B, Romio L, et al. Primary cilia of odontoblasts: Possible role in molar morphogenesis. J Dent Res 2009;88:910-5. Chapin HC, Caplan MJ. The cell biology of polycystic kidney disease. J Cell Biol 2010;191:701-10. Neville BW, Damm DD, Allen CM, Bouquot JE. Oral and Maxillofacial Pathology. 2 nd ed. Philadelphia, USA: WB Saunders Company; 2008.p. 591-2. Ong AC, Harris PC. Molecular pathogenesis of ADPKD: The polycystin complex gets complex. Kidney Int 2005;67:1234-47. Kim J, Ellis GL. Dental follicular tissue: Misinterpretation as odontogenic tumors. J Oral Maxillofac Surg 1993;51:762-7. Weston BS, Malhas AN, Price RG. Structure-function relationships of the extracellular domain of the autosomal dominant polycystic kidney disease-associated protein, polycystin-1. FEBS Lett 2003;538:8-13. Yoder BK, Hou X, Guay-Woodford LM. The polycystic kidney disease proteins, polycystin-1, polycystin-2, polaris, and cystin, are co-localized in renal cilia. J Am Soc Nephrol 2002;13:2508-16. Nauli SM, Rossetti S, Kolb RJ, Alenghat FJ, Consugar MB, Harris PC, et al. Loss of polycystin-1 in human cyst-lining epithelia leads to ciliary dysfunction. J Am Soc Nephrol 2006;17:1015-25. Chae SW, Cho EY, Park MS, Lee KB, Kim H, Kim U. Polycystin-1 expression in fetal, adult and autosomal dominant polycystic kidney. J Korean Med Sci 2006;21:425-9. Peters DJ, van de Wal A, Spruit L, Saris JJ, Breuning MH, Bruijn JA, et al. Cellular localization and tissue distribution of polycystin-1. J Pathol 1999;188:439-46. Palsson R, Sharma CP, Kim K, McLaughlin M, Brown D, Arnaout MA. Characterization and cell distribution of polycystin, the product of autosomal dominant polycystic kidney disease gene 1. Mol Med 1996;2:702-11. O Bukanov N, Husson H, Dackowski WR, Lawrence BD, Clow PA, Roberts BL, et al. Functional polycystin-1 expression is developmentally regulated during epithelial morphogenesis in vitro: Downregulation and loss of membrane localization during cystogenesis. Hum Mol Genet 2002;11:923-36. Geng L, Segal Y, Peissel B, Deng N, Pei Y, Carone F, et al. Identification and localization of polycystin, the PKD1 gene product. J Clin Invest 1996;98:2674-82. Hopp K, Ward CJ, Hommerding CJ, Nasr SH, Tuan HF, Gainullin VG, et al. 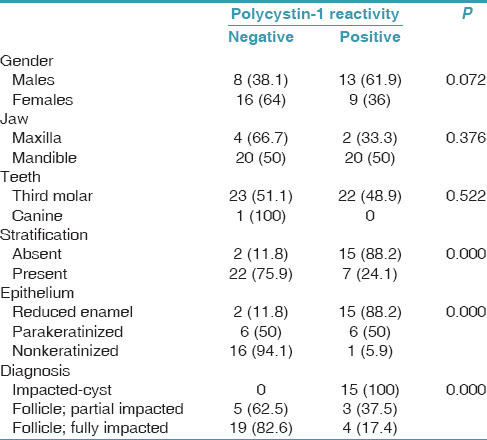 Functional polycystin-1 dosage governs autosomal dominant polycystic kidney disease severity. J Clin Invest 2012;122:4257-73. Nanci A, Slavkin HC, Smith CE. Application of high-resolution immunocytochemistry to the study of the secretory, resorptive, and degradative functions of ameloblasts. Adv Dent Res 1987;1:148-61. Chapin HC, Rajendran V, Caplan MJ. Polycystin-1 surface localization is stimulated by polycystin-2 and cleavage at the G protein-coupled receptor proteolytic site. Mol Biol Cell 2010;21:4338-48. Battini L, Fedorova E, Macip S, Li X, Wilson PD, Gusella GL. Stable knockdown of polycystin-1 confers integrin-alpha2beta1-mediated anoikis resistance. J Am Soc Nephrol 2006;17:3049-58. Godoy GP, da Silveira EJ, Lins RD, de Souza LB, de Almeida Freitas R, Queiroz LM. Immunohistochemical profile of integrins in enlarged dental follicles and dentigerous cysts. Oral Surg Oral Med Oral Pathol Oral Radiol Endod 2007;104:e29-34. Elizabeth J, Lakshmi Priya E, Umadevi KM, Ranganathan K. Amelogenesis imperfecta with renal disease - A report of two cases. J Oral Pathol Med 2007;36:625-8.